I arrived to Ketchikan on a Sunday. I was here for some alone time, to heal after two very intense weeks of work stress in San Francisco. Ketchikan is the cutest little town - I absolutely love it. 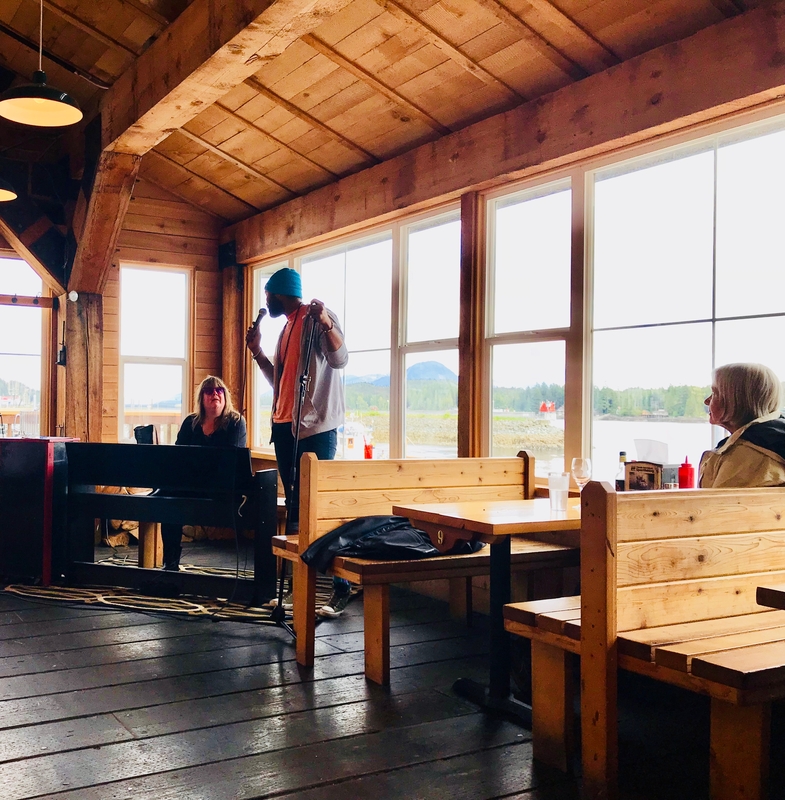 On Sunday nights, there’s a locals open mic night at the Fish House. I knew I had to check it out right when my amazing AirBNB host told me about it. The locals at the Fish House were so talented. I especially love being surprised. One woman, someone who seemed shy, someone I probably wouldn’t think twice about if I walked past her, had the most incredible voice. But it made me sad. Unhealthy food and health habits is such a strong part of American culture, it is no wonder I literally had to travel the world to figure out how to eat properly and finally feel good. In Indian Ayurveda-based and Chinese Tao-based medicine, food is considered medicine. It can either heal you or make you sick (if you take the wrong medicine). These medicines are centered around optimizing digestion, making sure you digest good nutrients to heal your body. It is very preventative - if you eat the right food, you won’t get sick. Simple as that. Just imagine the billions of dollars lost if doctors actually told everyone about actual proper nutrition instead of immediately prescribing random drugs. Not only from the doctors themselves and the pharmaceutical companies, but from the leading food manufacturers (almost every brand outside the fruits + veggies aisle in the grocery store), the cosmetics industry (hint: proper nutrition = great skin! ), all those well-marketed fad diet authors, the fitness industry (most people don’t actually need to exercise that much, diet is more important), psychiatry (many mental health issues are either caused or increased by unhealthy food), etc. “Let’s take a close trophological look at the “great American meal,” which is rapidly spreading digestive and metabolic malaise throughout the world via huge corporate fast-food chains. That all-American meal consists of a cheeseburger with french fries, washed down with a milk shake or sweet cola. A cheeseburger combines two different varieties of concentrated protein— meat and cheese. On top of that goes a big, fluffy bun of highly refined white flour— pure starch. Then comes a big bag of deep-fried potatoes, adding more concentrated starch, further fattened by deep frying in stale oil, to the meal. Finally, this mess is washed down with a big frozen milk shake, adding pasteurized milk to the meat and the starch and the fat, plus several spoons of refined white sugar to thoroughly gum up the works. I used to eat HEALTHY in America - I bought food at Whole Foods, and I still had many problems. The problem is that the common knowledge (again, this comes from great consumer marketing) is the opposite of what is actually true. So even if you stay away from junk food like cheeseburger + french fries + soda, you will end up bloated and gassy and sick anyway. Take the “breakfast is the most important meal of the day” saying… According to Ayurveda, when you wake up, your digestion is also waking up. It is weak. You should eat a very light breakfast meal - I now eat just fruit in the summer or a small bowl of spiced quinoa in the winter. Eggs + toast is a very bad food combination, a starch + protein. Add bacon to that, combining two forms of concentrated protein, and things only get worse from there. Add fruit juice to make things even worse. Cereal + milk is another horrible combination. Milk should be drunk alone, warm and spiced. Consuming it cold in the morning slows down digestion. Oh, and adding sugary cereal manufactured in a lab ensures poor digestion. My friend from India told me recently that she would never even think of drinking milk cold and raw until she came to America. That is why you read about all those unhealthy horrible side-effects from drinking milk - hormone imbalances, infertility, cancer, etc. Yogurt + fruit - a health staple in America, is another horrible food combination. Again, dairy should be consumed on it’s own. Combining it with fruit is going to ferment things in your gut, causing horrible bloating and gas, as well as a great meal for bad bacteria. Lunch, when your digestion is at it’s highest, is the most important meal of the day. That is when you can eat the most. Dinner, on the other hand, should be very light and easy to digest - a vegetable soup is great. Instead, in America, dinner ends up being the biggest meal of the day. Many skip lunch or eat it fast because of work meetings and other commitments. I wasn’t even eating healthy snacks well. For example, almonds are healthy. Well, I used to eat A TON of almonds. No wonder my skin was breaking out from being too oily. I recently learned that almonds should actually be soaked to easily remove the skin, which apparently contains a toxin in it. If you google the health benefits of almonds, you’ll get the information you searched for - they’re healthy! But that article won’t tell you to eat only a handful and that the skin has poison in it. You have to know to google about soaking almonds to find that information… So the Internet, despite having all the information available, is not useful, even for those who want to be healthy. You have to know to google “food combining” and “Ayurveda” to even start understanding the basics of a proper diet. The first time I went to Safeway (an American grocery store) in Ketchikan, I walked out exhausted. Walking through all the aisles was exhausting and depressing. There was so much choice compared to every other country I’ve been in, many of which operate on simple farmer markets with only seasonal food available. But all that choice was between an unhealthy item marketed as “healthy” and a less unhealthy item. I had to read all the labels, and ended up choosing nothing a lot of the time. The fruit and vegetable aisle is so small compared to the rest of the store. P.S. If you’re interested in taking back control of your health, I highly recommend starting by reading Ayurveda Lifestyle Wisdom by Acharya Shunya.